I’m always looking for new ways to cook the same old ingredients. 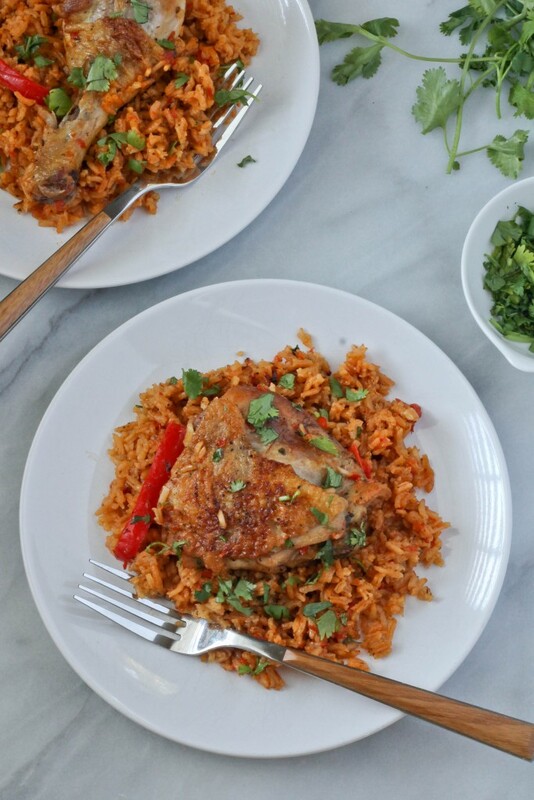 I have to admit that chicken and rice and two ingredients that are in heavy rotation around here and it can be challenging at times to find new ways to cook it. 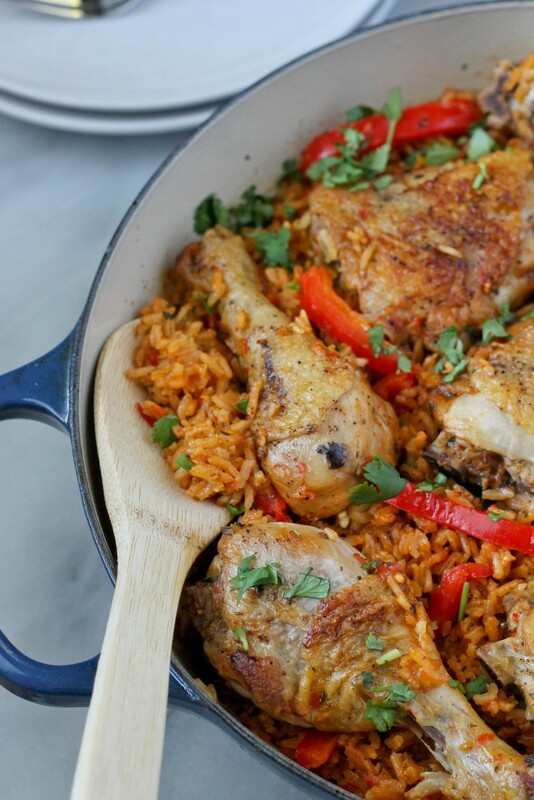 I’ve always been intrigued with arroz con pollo (which is literally chicken with rice) and over the years have been tweaking this dish a bit to suit my liking. 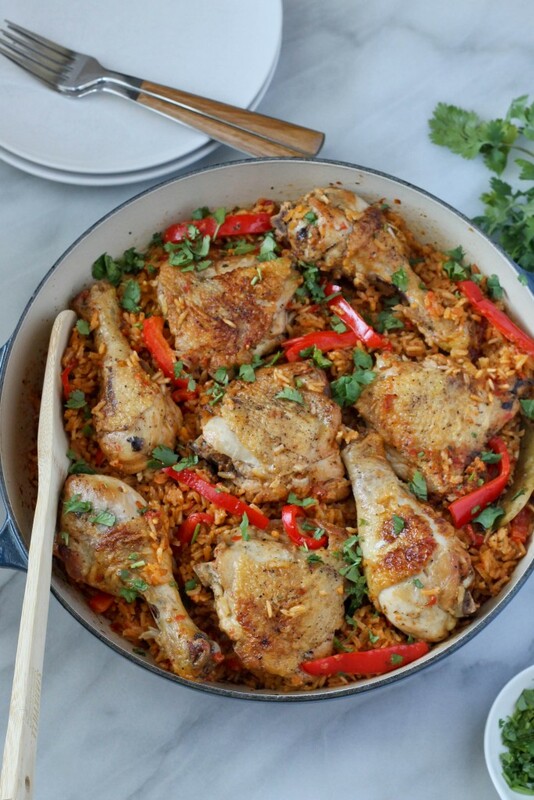 Similar to paella, this dish is popular in the Latin community and it’s easy to see why – it’s a one dish meal that loaded with flavor and a crowd pleaser. In a food processor or blender, coarsely chop 1 peeled and chopped onion, 1 red bell pepper with seeds and stems removed, garlic cloves with skin removed and cilantro and set aside. Season both sides of the chicken legs and thighs with salt and black pepper. In a wide pot over medium, add oil. When oil is hot, add chicken and brown on both sides. Remove chicken from the pot and set aside and discard all but 1 tbsp of oil. Add chopped vegetable blend and tomato paste and cook until the vegetables begin to soften, about 5 minutes. Add rice, chicken broth, sazon, dried oregano, cumin and bay leaf and stir to a combine. 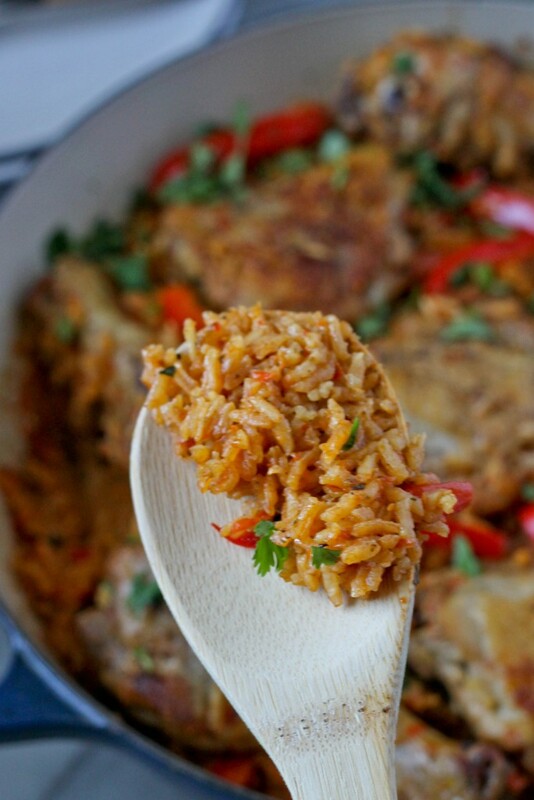 Place browned chicken pieces and remaining half of red bell pepper that’s been thinly sliced on top of the rice and bring the pot to a boil. Lower to a simmer then cover and cook for 20-25 minutes or until the rice is cooked. Garnish with freshly chopped cilantro before serving. I made this for my family and followed the recipe exactly! It turned out soooooo good! It was absolutely delicious. Thank you for the wonderful recipe!